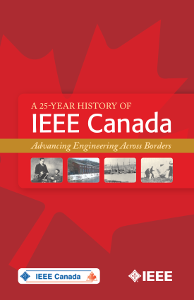 On this page, we are assembling links to pages that record the history of IEEE Canada – its Councils, Sections, Chapters, Student Branches, and its people. If you have information that could be posted on this web site, please contact the webmaster. 1884 – AIEE formed in Philadelphia by 25 electrical experts including Thomas Edison and Alexander Graham Bell. You will also find historical details about our predecessor societies, IEEE and CSECE (which was part of EIC), as well as the history of our conference CCECE (Canadian Conference of Electrical and Computer Engineering), our journal CJECE (Canadian Journal of Electrical and Computer Engineering), and our magazine (IEEE Canadian Review).